National Drugs Conference of Ireland 2011 “Drug Interventions: What Works? The National Drugs Conference of Ireland “Drug Interventions: What Works?” will take place in Dublin on the 3rd and 4th November 2011, in the Radisson Blu Royal Hotel Golden Lane, Dublin. This years conference will build on the success of the 2010 conference, bringing together a range of national and international speakers from across the spectrum of addiction research, service provision and policy. Sponsorship of the conference is provided by the HSE’s National Addiction Training Programme (NATP), as part of the ongoing commitment of the HSE to work in collaboration with partners in the community, voluntary and statutory sectors addressing drug and alcohol issues. We shall update the list as we receive further information. 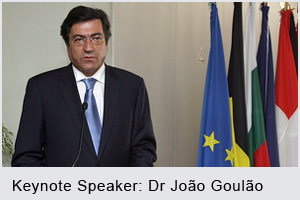 João Goulao is the Portuguese National Drugs Coordinator and has overseen the current Portuguese Drugs policy , Chairman of the Institute on Drugs and Drug Addiction and since January 2010 Chairman of the European Monitoring Centre on Drugs and Drug Addiction (EMCDDA). He is also Head of the national focal point in the EMCDDA’s REITOX network, member of the EMCDDA Board since 2005 and previously served on the European agency’s Scientific Committee (1997–2002). A medical doctor by profession, Dr. Goulão has over 20 years’ experience regarding drug-related issues. Prior to his role in federal government, Dr. McLellan was a career researcher for 35 years with the Treatment Research Institute (which he co-founded in 1992) and the University of Pennsylvania.. In his career he has published over 400 articles and chapters on addiction research. He has received several distinguished awards including Life Achievement Awards from the American, Swedish, Italian and British Societies of Addiction Medicine and most recently from the American Purblic Health Association (2010) Dr. McLellan holds a B.A. from Colgate University and his M.S. and Ph.D. from Bryn Mawr College. He received postgraduate training in psychology at Oxford University in England. Dr Deluca is a Senior Research Fellow in addictive behaviour, with a background in cognitive and developmental psychology, and more than ten years experience in the addiction field. He was lead researcher and co-principal investigator on the EU funded Psychonaut 2002 and Psychonaut EWS projects on illicit drug information and availability on the Internet which have developed a web monitoring system for new recreational drugs, and an European study on drug and alcohol prevention in the workplace. Recently, he has been awarded a grant from the EU DG public health (2010-2011), which is looking at the Internet and other ICTs to deliver prevention services addressing the use of novel compounds in vulnerable individuals (ReDNet research project). Paolo Deluca has also extensive expertise on national and international clinical trial management, intervention development, delivery and evaluation with the Department of Addictions Institute of Psychiatry King’s College London London. Greg Purvis is the Director of Addiction Services for three District Health Authorities (Colchester/East Hants, Cumberland and Pictou Counties) in Nova Scotia. Greg is one of 6 people certified internationally as a trainer in the Community Reinforcement Approach (CRA). Greg served as a member at large for the Association of Psychologists of Nova Scotia between 2000-2002 and is a registered clinical psychologist with the Nova Scotia Board of Examiners in Psychology. He is currently chair of the Atlantic Canadian Counsel on Addictions. Martin Woods has worked in the anti-money laundering space ever since 1984 when the first drug trafficking act offences became law in the UK . He has been investigating money laundering and money launderers for in excess of 25 years, initially as a police officer, then as a money laundering reporting He has a wealth of experience as an investigator He was a member of the National Crime His experience enables him to deliver real life case studies which draw upon a deep reservoir of anecdotal money laundering cases. Brian has worked in health and social care for 13 years managing services across a variety of treatment sectors. He has managed generic treatment services across London and developedstimulant and crack cocaine provision in Wandsworth and Greenwich. He was a member of the National Treatment Agency working party that evaluated and modified ITEP materials at The Institute of Behavioural Research in Texas and has lead the implementation of ITEP across Blenheim CDP and as a training package for the sector. He has an MA in Health and Social Care Management and is presently a post graduate student in Organisational Consultation at the Tavistock Institute . Brian is currently Director of Client services at Blenheim CDP. Martin has worked in drug and alcohol treatment within London for over twenty-five years He has developed and led a wide range of treatment services across London and (with enthusiasm!) contributed to many of the developments in the UK drug treatment field including QuADS, ITEP, and stimulant specific treatment services. Martin is a qualified Practice Teacher and possesses a Post Graduate Diploma in Substance Misuse. He has also just completed an MA Leadership and Strategic Management at the Tavistock Institute and currently works as a Director of Client Services at Blenheim CDP. Meeting the needs of Travellers - Good practice guidelines for drug & alcohol services. In this video, Tim Bingham, a member of the Conference Steering Group, provides additional information relating to this years conference. I am hoping that with this convention many people especially those who are using and selling illegal drugs will be lessen up. And with this convention minors must learn the bad effect not just on drugs but as well as on alcohol etc.